Austerity And Growth, Again (Wonkish), by Paul Krugman, in NY Times: Kash has a nice summary of what the new Eurostat numbers on budget balance mean. So I thought I’d do a bit more. What Eurostat gives us are budget balances in euroland as a percentage of GDP. Kash focuses on the change from 2009 to 2011 as an indicator of austerity, although as he notes, falling GDP means that the true amount of austerity in places like Greece is much bigger than that. Let’s run with that, and create a crude adjusted measure of austerity. I calculate the amount the budget balance “should” have changed as 0.45*(growth from 2009 to 2011 – 4). In this formula, 0.45 is the average share of government revenue in GDP in the euro area, so this is a rough measure of revenue effects of growth; I’m just assuming that 4 percent would represent normal growth for a euro country over 2 years. And I estimate austerity as the difference between the actual change in budget balance and this predicted change. So this is a kind of Cary Brown computation. It’s also sort of what Alesina and Ardagna do, but applied to a period in which big moves in deficits are clearly driven by austerity policies, so the many objections to their work don’t have their usual force. 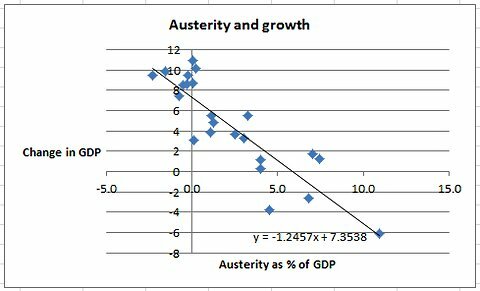 What do we get if we plot this estimated austerity against the actual change in real GDP 2009 to 2011? An apparent multiplier of around 1.25, not out of line with other estimates. This entry was posted in “Saltwater” vs “Freshwater”, Paul Krugman. Bookmark the permalink.